Last week, I got real about recipe failures, and how often they befall food bloggers. My case in point was a red pepper, wakame, and basil soup that was downright nasty. They always say that the best way to deal with a stumble is to get right back on the horse, or the bike, or whatever you’ve fallen off, so I didn’t want to wait too long before I ventured into the raw soup territory again. 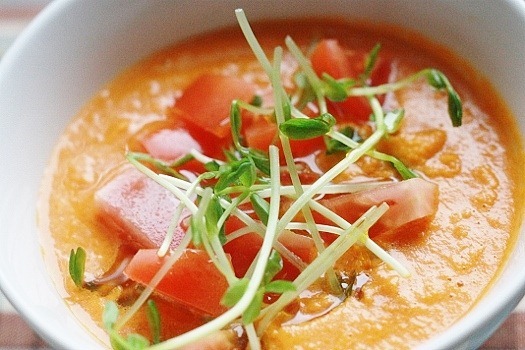 This all raw, vegan gingery carrot tomato soup was the perfect redemptive recipe. 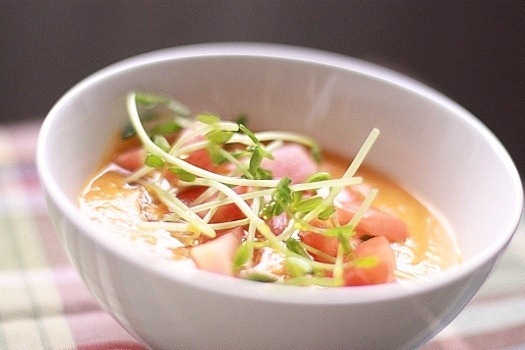 Raw soups may be the least popular of all raw recipes. It’s not hard to get anyone into into a raw chocolate tart, or banana soft serve, or a scrumptious smoothie, or even massaged kale salad. These recipes are just too delicious to hate on. Raw soups, though? Tricky. There’s no food that we associate more with warmth and warming than a bowl of soup, so the raw version often measures up poorly to conventional standards. Beyond that, as my pepper wakame soup catastrophe proves, it’s very hard to get raw soups right. How can something so simple—blended vegetables and liquid—be so easy to bungle? Well, first there’s the question of texture. Raw soups are like green smoothies: if you don’t at least have a powerful blender, you may have a hard time eliminating bumps, lumps, chunks, and other icky textural pests. If you’re making a soup with intended texture, it’s easy to add too much liquid (and make it too soup) or too little (in which case it’ll be pasty). And, as with many raw dishes, ingredients have to be tip top. 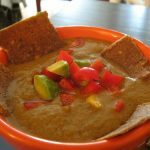 Raw soups are typically very simple, and have very few ingredients: many involve only a few vegetables, some avocado, and some water. If you’re working with an avocado that’s started to go off, or vegetables that are tasteless, the soup will be disappointing indeed. I try to work only with fresh, local, and organic produce when I make raw soup: it makes a big difference. 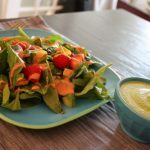 If you’re working with a normal blender, but you’ve caught the raw soup bug, I strongly suggest working with vegetable juices, rather than whole, raw vegetables (especially crunchier ones). 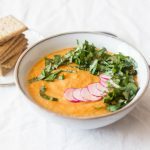 My raw carrot and avocado bisque is a great example of a soup that’s very blendable because it’s juice and avocado based. 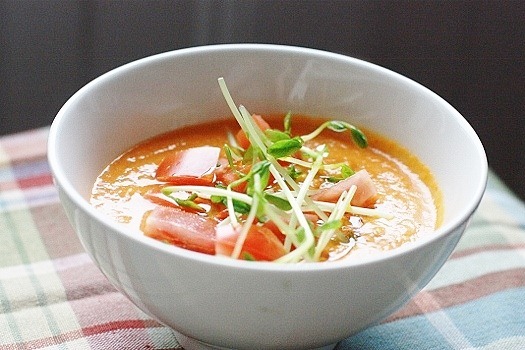 Or, if your blender can handle the challenge of raw carrots and tomatoes, give this gingery soup a shot. I made it for lunch today, along with some of my raw tomato bread and a big salad, and it was an instant hit. But then, with so many of my favorite ingredients–tomatoes, carrots, dates, ginger—how could it not be? 1) Blend all ingredients save the flax oil in a high speed blender till smooth. 2) Add the tbsp flax oil in a thin stream, till soup is light and creamy. Serve! And the tomatoes and a drizzle of flax oil were a nice garnish. I also loved dipping my raw tomato bread in it! I think this soup will also make a great dip/dressing, and intend to use it that way soon! Hope you guys are encouraged to test the waters of raw soup making. I promise that they’re much tastier and rewarding than you may think. Done right (and I’m the first to admit, it ain’t always easy to do them right), they showcase raw food at its very best: clean, simple, flavorful, and focused on quality ingredients. Edited to add: I posted in such a rush today that I forgot to wish you all a very happy passover. Julia asked me if I could post anything on the topic, and I decided that the best thing to post would be a link to two of Leslie’s excellent posts on holidays and what they signify to us as eaters. The first describes her feelings about fasting on Yom Kippur, and the second her passover food experiment. Please enjoy them, and have a wonderful start to the holiday! Ooh that looks so good!! I really want to make that tomorrow – but I’ve got no carrots (only parsnip) and just average tomatoes, like golf ball size. Do you think it would still be tasty (given what you wrote about ingredients quality) or would I be fighting a losing battle? I think the tomatoes are fine, but I wonder how parsnips would sub for carrots. Hmmmm. If you do tomatoes only, it’ll be much more watery, so I’d add more dates — maybe even a little avocado? Anything for thickness. Or be brave, and try carrots! This looks so delish. Going to have to put my trusty Oster to the test! I like to make a raw soup inspired by the Spanish tapa dish pan con tomate. Just a container of really nice fresh cherry or grape tomatoes, a tiny bit sea salt and olive oil, a dash of lemon juice, and a tablespoon of avocado to emulsify. Can also add walnuts or pine nuts for protein and a little texture if desired. It’s kind of like gazpacho but simpler. Which reminds me, gazpacho must be my absolute favorite raw soup! So happy it’s almost time for it again! yum! this looks so fresh and delicious! I heart ginger. I have yet to try a raw soup; this may need to be my first!! you had me at raw soup! i’m sitting here with my mouth open! “icky textural pests” = LOL but so true! I love my Vita and for the past 3-4 yrs have used it almost daily. Worth it’s weight in gold! I love the picture with the caption sweet and spicy in a bowl. Just beautiful…both the pic and the caption/flavors. I’m still a little apprehensive about raw soups, but this one sure does look pretty! I think I’m afraid because once, I made a spinach apple soup from “Raw Food Made Easy” and it was horrible. I think they are perfect as dressings, though! That sounds great–I love the sunflower sprout garnish too: it would pair so well with a ginger note. I love raw soups–but I love soups, period. You’re right: it’s the very last item of rawdom that I would dream of serving my husband! 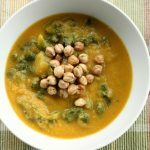 My raw soups are often little different than green smoothies (since I’ve been off of fruit for a long time–looking forward to the end of that, though) but I love to change it up sometimes and chop veggies in for texture, add sprouts as stir-ins, sprinkle nooch on top, even do a two-tone swirl. 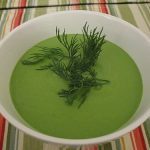 I recently posted a ‘whirled peas’ recipe with ginger and lemongrass that was pretty tasty. I’ve never gotten why raw soups get such a bad rap. The worst raw food I’ve tasted has always been the “gourmet entrées” or crackery dehydrated stuff; they can sometimes taste like a musty health food store. Or something containing mass amounts of sprouts, because they are the one food in the world I just can’t get a taste for. 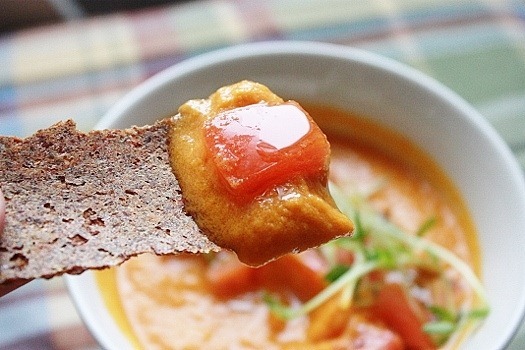 Oh, and I’ve tasted some raw chocolate that didn’t quite steal my fancy, and a few desserts that were “meh,” but I’ve always had excellent luck with your soups — my fav is your Moroccan Spiced Carrot Soup. And Suzanne’s Harvest Soup! But the Moroccan one was what introduced me to the combined awesomeness of tahini and carrot. Yum! It might be because I’m from a really hot climate. To me, a chilled soup is delicious, because it’s rare I ever crave a hot bowl of soup. I never grew up with them as a comfort food, except for chicken noodle when I was sick. It has to be thick though, so I can dip stuff in it! (Making) raw soup scares the crap out of me. Will you make this for me please? I fear I’ll mess it up. In a word: yes, I sure will. This looks so light and fresh! I love the garnishes you chose, too. shoot lost a comment. in a great big bowl of raw soup. i think i said that nongreen raw soups are less of a stretch, although i like green drinks. if you add hot water to the soup it helps warm it up too. my fave raw soup is cucumber dill on a hot day. I’m getting so so excited for summer soup weather. I had a taste test of gazpacho today at the store. SO GOOD. I remember getting into raw soups with our cheap blender, what a difference when I got a Vita-Mix! A cheap blender will do it, but not as smooth. Thank you for this post, Gena! I adore raw soups especially in warmer weather and I need to get back into them. This recipe look fabulous! I think I am one of those odd people who like a raw soup. I’ve always loved gazpacho so maybe that helped. I love that addition of ginger–it probably “warms up” the soup, yes? I must try this. Sounds like a very interesting flavour profile in that soup, I may have to try it. I once made a raw soup that had the texture of – well something that normally comes out of one’s mouth. I tried to drink it but that really didn’t work. High speed blenders are where it’s at! After sadly neglecting my Vita-Mix for over a month because bananas currenlty cost $2.5 and I was completely failing at making tasty non-frozen-banana smoothies, this is brilliant! I have endless carrots in the fridge, and plan to use my thyme-infused olive oil instead of flax oil. Hurrah! I’m actually a huge fan of cold soups, especially gazpacho! This looks great too! 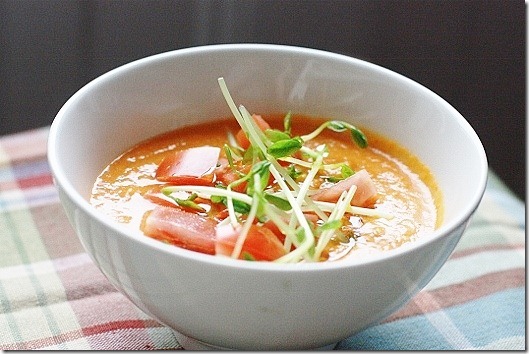 The only raw soup I’ve tried is gazpacho, but this looks really good! I even have some tomatoes and carrots I need to use up, so maybe I’ll make it today. Ooh, I’ve been hoping for a raw, non-green soup recipe… and this totally delivers. Thank you! I know what you mean about raw soups being tricky. Sometimes you can make the perfect combination when all the ingredients are in season. Then, when you attempt it again with some less flavorful veggies, the results can taste terrible. This one looks delicious, though. I’ll have to try it when the tomatoes are in abundance. I tried this and love it. I especially like the simplicity and how I can make this again w/out having to pull out a recipe to remember the ingredients and amounts. Also, there are no hard-to-find ingredients. The flax oil and dates can easily be subbed with similar ingredients — so anyone can make this! Nice recipe Gena!